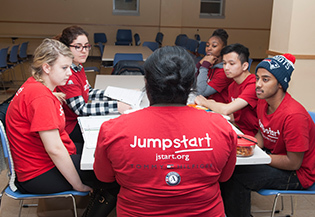 A Jumpstart team leader collaborates on a team of Jumpstart members to provide educational activities to young children and families. Responsibilities include planning and implementing effective Jumpstart classroom activities using the Jumpstart curriculum, facilitating team meetings, and coaching members to use developmentally appropriate practices with young children. The team leader plays a variety of roles, including coach, trainer, and observer and is essential to making Jumpstart a high quality program. This position serves vulnerable populations, i.e. preschool children. Able to verbally communicate with peers, Jumpstart staff, children, children’s families and classroom teachers and model appropriate interactions for team members. Able to facilitate connections between members and children’s families including multiple means of communication (notes, newsletters, in-person conversations, etc.). Able to interact with preschool-age children at their level in a classroom setting with high activity and noise levels and other varying environmental conditions. Interaction includes being able to move around the classroom to participate in various activities with the children. Able to participate fully in and lead a team of peers in implementing Jumpstart programming – two times per week for two hours each, totaling four hours a week. This classroom time includes a variety of activities in a consistent routine such as reading, small and large group activities, and facilitating centers. Team leaders lead and/or manage some of these activities and ensure that programming follows Jumpstart guidelines. Able to hear children and adults in order to participate in back and forth conversations. Able to demonstrate effective reading skills in English in order to implement Jumpstart programming. Includes reading children’s books, song charts, and materials in the classroom. Able to participate fully in 30+ hours of pre-service (including additional team leader training) and 10+ hours of on-going in-service trainings, and weekly team leader meetings, broken down in 1/2-8 hour increments/ exact increments will vary. Trainings are delivered in a variety of formats including web-based trainings, group in-person trainings, PowerPoint presentations, small group discussions, and role-plays. Able to lead a team of peers during 1+ hour team planning meetings and classroom activity preparation 2-5 times per week, which includes demonstration, planning, reflection, and/or training, for a total of 2-5 hours per week, working with other members in a small group to reflect on and plan for weekly classroom activities. Able to complete 1-5 hours weekly of individual planning and preparation for Jumpstart classroom activities. This includes preparing for team leader-led elements (such as Group Meeting) and gathering materials for classroom activities. Able to demonstrate effective reading skills in English in order to participate in the Jumpstart program. Includes reading lesson plans and training manuals. Able to participate fully in 2-5 hours each week in additional individual classroom service, implementing individualized activities with children and supporting teacher-led activities. This participation involves working with preschool-age children and other adults in a preschool classroom. Able to attend periodic service days and events outside of regularly scheduled service, occasionally held on weekends. May involve leading one’s team in these activities.